SAN JOSE – The no.1 seed San Jose SaberCats will host the no.2 seed Arizona Rattlers for the National Conference Championship Game on Saturday, August 22nd at the Stockton Arena. Kickoff is set for 5:00 pm PDT and you can catch the action on ESPNEWS, as well as KDOW 1220AM. One of the best rivalries in Arena Football League history will add another chapter to the saga, with a trip to Arena Bowl XXVIII on the line. 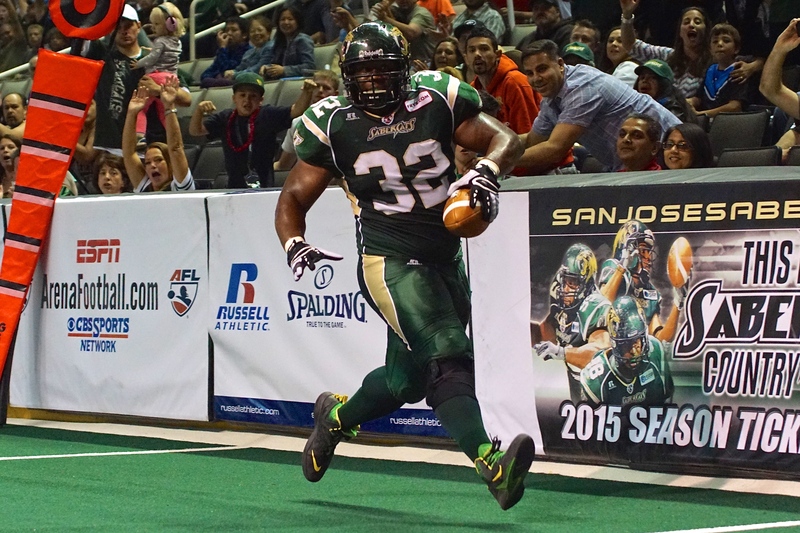 Three weeks ago the San Jose SaberCats clinched home field advantage throughout the 2015 AFL playoffs with a home victory. That crucial win was over the three-time defending Arena Bowl Champion Rattlers, the same team that knocked the SaberCats out of the playoffs in last season’s National Conference Championship game. This season, however; San Jose statistically has the top scoring offense and defense in the league, while defeating teams by a remarkable average of 22.2 points per game in the regular season. 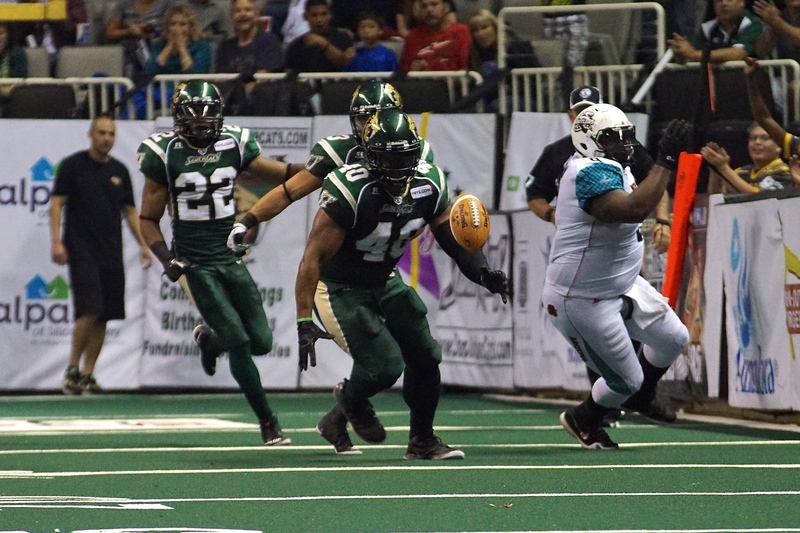 The previous meeting between these rivals was on July 31st, where the SaberCats defeated the Rattlers 56-29. San Jose held a slight, 29-26 lead at halftime, before outscoring Arizona 27-3 in the second half, en route to the victory. Quarterback Erik Meyer threw for 286 yards and eight touchdowns (second highest total of the season), while completing 72.5-percent on his passes and was not sacked. Despite the strong attack of the Rattlers’ pass rush, the SaberCats offensive line proved to be a force in keeping Meyer protected. The receiving tandem of Reggie Gray and Maurice Purify asserted itself as the catalyst on offense. Each had three touchdown receptions in the contest, with Gray hauling in 11 receptions for 88 yards and Purify leading the way with 108 receiving yards. The leading receivers for the SaberCats over the final three weeks of the regular season propelled San Jose to 289.0 total yards of offense per game. Ranked as the number one scoring defense this season, the SaberCats held Arizona to under 30 points for the first time this season. The leading tackler in the AFL this season, Second Team All-Arena defensive back Ken Fontenette had eight tackles and broke up four passes. Roaming the middle of the box, David Hyland had 7.5 tackles two pass breakups and an interception of Nick Davila. Leading the league in total sacks, the San Jose pass rush was a disruptive force, totaling three sacks, led by Donte Paige-Moss with 1.5 sacks. Earning 2nd Team All-Arena Francis Maka had 0.5 sacks and blocked a kick, which was returned by Rodney Fritz in the second quarter. 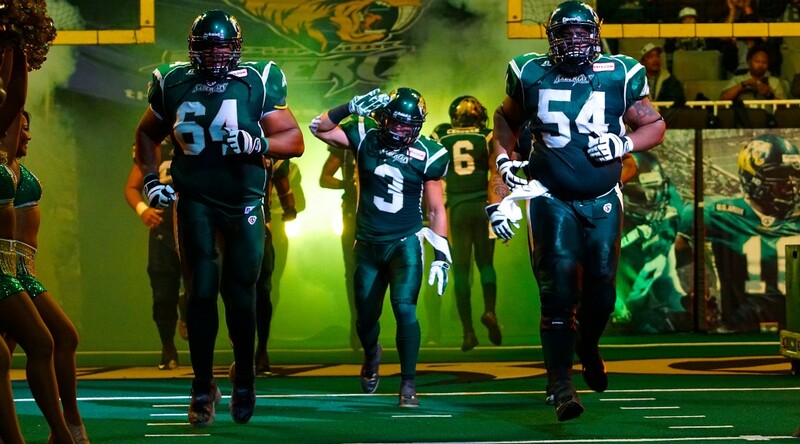 To reach the National Championship game, the SaberCats defeated the Portland Thunder in the quarterfinals of the AFL playoffs last week. Jumping out to a 35-7 lead, San Jose remained in control, answering on any attempt the Thunder had at a comeback. 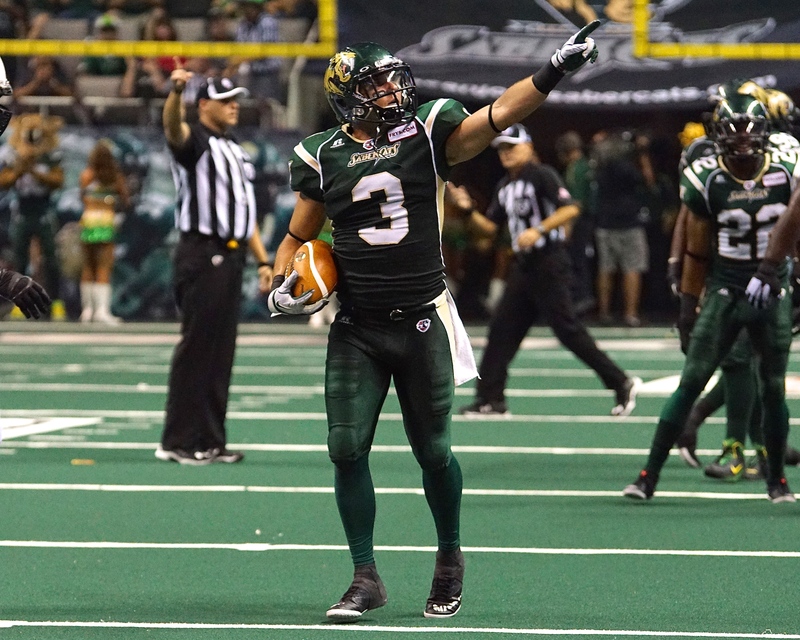 First Team All-Arena receiver Reggie Gray, the AFL leader in receptions and total touchdowns this season, returned a 57-yard kickoff for a touchdown and added two more receiving scores while Maurice Purify led the SaberCats with seven receptions for 81 yards. 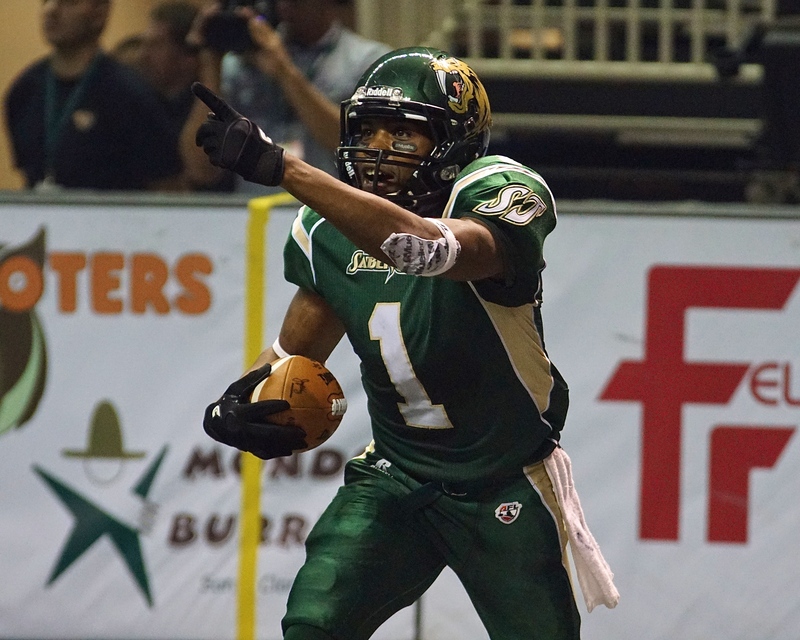 In his sixth season with San Jose and a member of the 2007 Arena Bowl Champion SaberCats squad, Ben Nelson had 50 receiving yards, adding two touchdowns as well. With the elusive D.J. 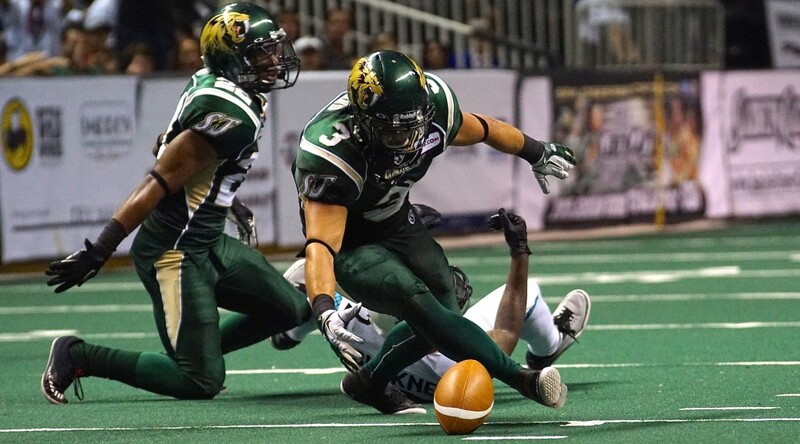 Stephens and “Superman” Odie Armstrong, the SaberCats offense, which led the AFL in scoring (58.9 points per game), has an array of talented weapons for the 2013 AFL MVP Meyer to unleash. Meanwhile, the Rattlers advanced to the National Conference Championship game behind a 72-41 home victory over the Spokane Shock. Davila threw eight touchdown passes, including four to Rod Windsor, who hauled in nine receptions for 112 yards. Chase Deadder led the way for Arizona with nine receptions for 121 yards, adding three touchdowns. Arizona was in first half battle with the Shock, holding a slight, 30-28 lead at halftime before outscoring the Shock 42-13 in the second half. Defensively, the Rattlers had interceptions by Jeremy Kellem and Ben Wells, while Marcus Pittman added a sack. 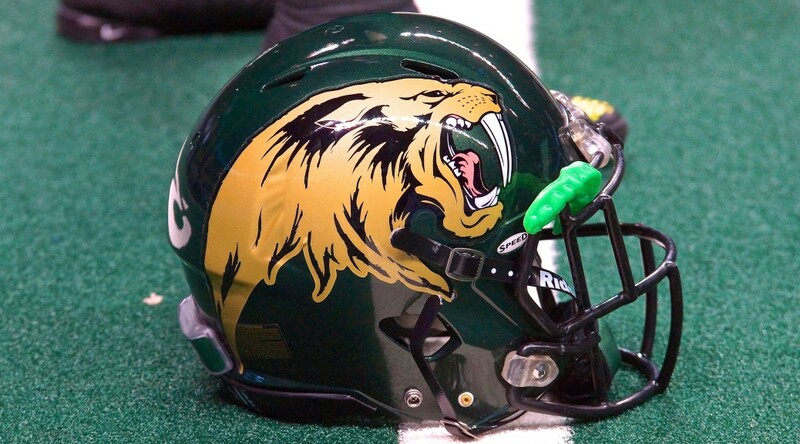 With a win over the Rattlers, the SaberCats would host Arena Bowl XVIII at the SAP Center on Monday, August 31st for a chance at a team’s fourth championship. The winner of this game will face off against the winner of the American Conference Championship game between the Philadelphia Soul and the Jacksonville Sharks. SAN JOSE – The San Jose SaberCats (16-1) clinched the number one overall seed in the Arena Football League and home field advantage throughout the playoffs, with a triumphant 56-29 victory over the Arizona Rattlers (13-4). The showdown featured the previous two AFL Most Valuable Players in quarterbacks Erick Meyer and Nick Davila. Leading the way for the SaberCats, Meyer, the 2013 MVP, completed 73 percent of his passes for 286 yards and eight touchdowns. Meanwhile, the San Jose defense came up huge, allowing just three second half points. “We didn’t play well the last two games in our mind and we wanted to come out and have a good showing with a lot of energy and they did that tonight,” said Owner and Head Coach Darren Arbet. The Rattlers got on the board first when fullback Mykel Benson finished a six play drive with a three-yard touchdown run. San Jose would answer on a scoring drive of its own, as Reggie Gray caught a seven-yard pass and dove into the end zone, evening the score at 7-7. Arizona would answer in the second quarter with an eight-yard touchdown pass from Nick Davila to Rod Windsor and another score on a 20-yard pass to Kerry Reed, as the Rattlers led 20-7. With the history of these two rivals, the back-and-forth pendulum swung, as the SaberCats cut into the Rattlers’ lead with an 11-yard touchdown pass from Meyer to Maurice Purify. The touchdown was the first for Purify as a SaberCat, who spent the past three seasons with Arizona, and cut the lead to 20-14. The momentum carried over for the SaberCats after Davila fumbled the snap and Donte Paige-Moss recovered the ball, giving San Jose possession. The SaberCats would capitalize with a 10-yard touchdown reception by Odie Armstrong to tie the game 20-20 with just under a minute remaining in the first half. Arizona followed the 14 points scored by San Jose with a 10-yard touchdown reception by Windsor; however, the PAT kick would be blocked by Francis Maka and scooped up by Rodney Fritz, who returned the kick, awarding the SaberCats two points and cut the lead to 26-22. Following the stellar special teams play, San Jose scored on a four-yard pass from Meyer to Purify, his second of the game, as the SaberCats held their first lead of the game at 29-26 to end the first half. After recovering the second half kickoff from a ball off of the net, the Rattlers tied the game 29-29 with a 27-yard field goal by Fabrizio Scaccia. 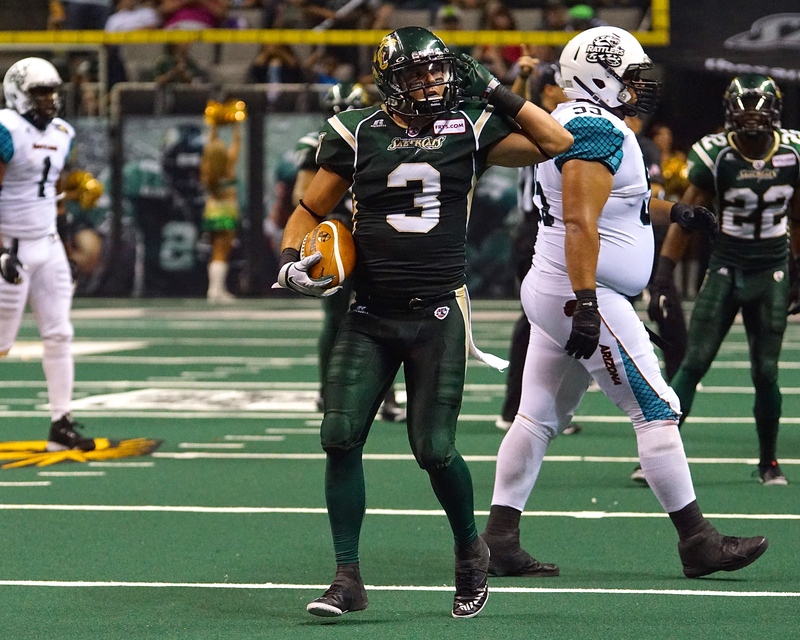 The SaberCats would answer as Gray would get open in the back of the end zone for the 16-yard touchdown reception, giving San Jose a 35-29 edge. 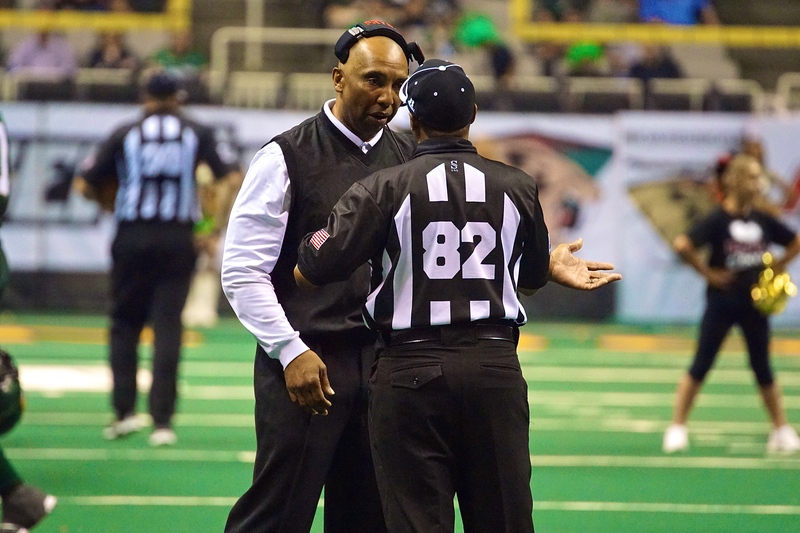 The SaberCats’ number one ranked defense continued to stifle the Rattlers. Following an interception by David Hyland, San Jose capitalized on the turnover when Purify grabbed the pass from Meyer, broke a tackle and took off for a 34-yard touchdown, as the SaberCats lead swelled to 42-29 with 1:38 remaining in the third quarter. Purify finished with 10 receptions for 108 yards and three touchdowns. Not allowing the Rattlers to get into a rhythm offensively, Donte Paige-Moss and Francis Maka teamed up for back-to-back sacks to force a 4th and 19, culminating in an incomplete pass by Davila and turnover on downs. Leading the AFL in touchdown receptions, Gray would find a soft spot in the end zone and haul in his third touchdown of the game, extending the SaberCats lead to 49-29. With a routine 12-yard reception in the second quarter, Gray broke Jason Willis’s franchise record for most receiving yards in a season (1,606) set in 2013. Gray, who hauled in 11 receptions for 88 yards and three touchdowns, is now the SaberCats all-time leader in receptions, receiving yards, touchdown receptions and scoring in a season. 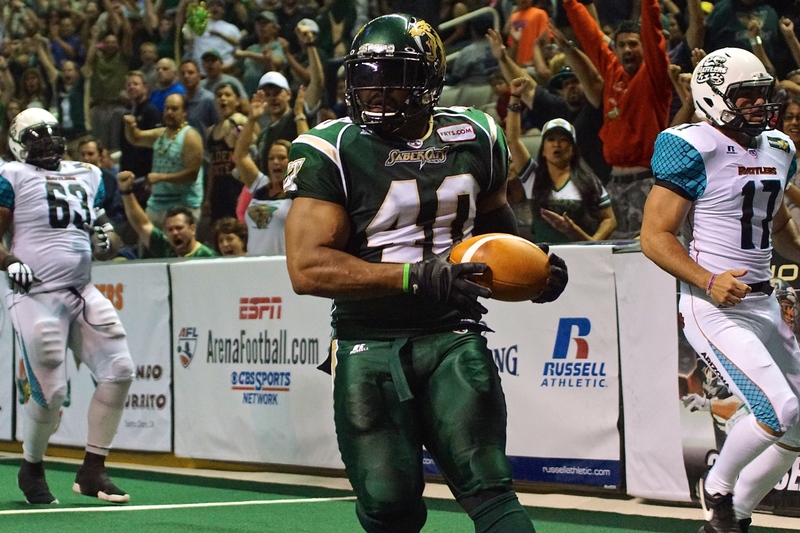 Veteran SaberCat Clevan Thomas recorded two tackles, en route to becoming the ninth player in Arena Football League history with 600 or more career tackles. The SaberCats will hit the road to take on the LA KISS on Saturday, August 8th in the regular season finale. 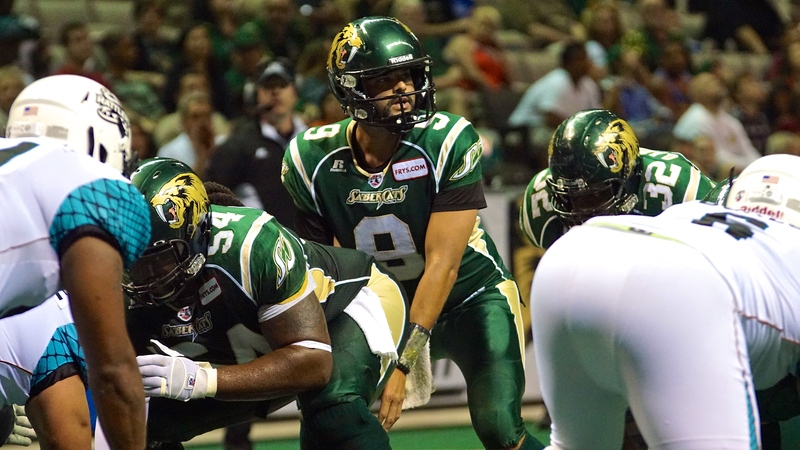 TAMPA BAY, FLORIDA — The San Jose Sabercats had a 26-7 lead at half-time. They were tested in the 4th quarter by a 20-point rally by the Tampa Bay Storm . The SaberCats held on for the 36-27 victory and improved to 3-0 for the first time since 2004. It is the SaberCats second road victory in the three games played this season. They did so in front of 8,588 fans at AMALIE Arena on Friday night. History was made when Storm wide receiver T.T. Toliver became only the fourth player in Arena Football League history to record 1,000 career receptions when he gathered in a nine-yard pass from Jason Boltus with 4:21 remaining in the second quarter. Toliver joins current Storm head coach Lawrence Samuels, as the one of only two players in franchise history to achieve the plateau. The 38-year-old Toliver now needs five catches to surpass former AFL receiver Chris Jackson and move into 15th place on the all-time receptions list in professional football history. On the opening drive, SaberCats’ newly acquired wide receiver D.J. Stephens thought he had his first touchdown reception as a SaberCat but the play was nullified by a holding penalty on the offensive line. On the ensuing play Darius Reynolds made a one-handed catch in the back of the end zone on fourth down but he was unable to get his feet in-bounds and San Jose turned the ball over on downs. On the ensuing drive, the SaberCats top-ranked defense proved its worth, as they forced a Storm fourth down from the seven yard line. On fourth down, defensive end Rodney Fritz stripped Storm quarterback Jason Boltus as Jason Stewart grabbed the ball in the air for an interception, the first on the season for the 2014 AFL Defensive Player of the Year. Stewart continued to be effective, as he forced a safety to end the first half as well. Leading the defensive front, Fritz had a forced fumble and two sacks, tied for the game-high for San Jose. Defensive end Donte Paige-Moss also had two sacks and forced a fumble that was recovered by David Hyland, his second of the year. Acquired early this week, Stephens got on the board in the 2nd quarter with a 16-yard touchdown reception as he hauled in the pass while flying over the boards to give San Jose a 14-0 lead. Stephens made a miraculous 31-yard touchdown reception in the fourth quarter, caressing the ball against his leg while falling down to pull in the catch. 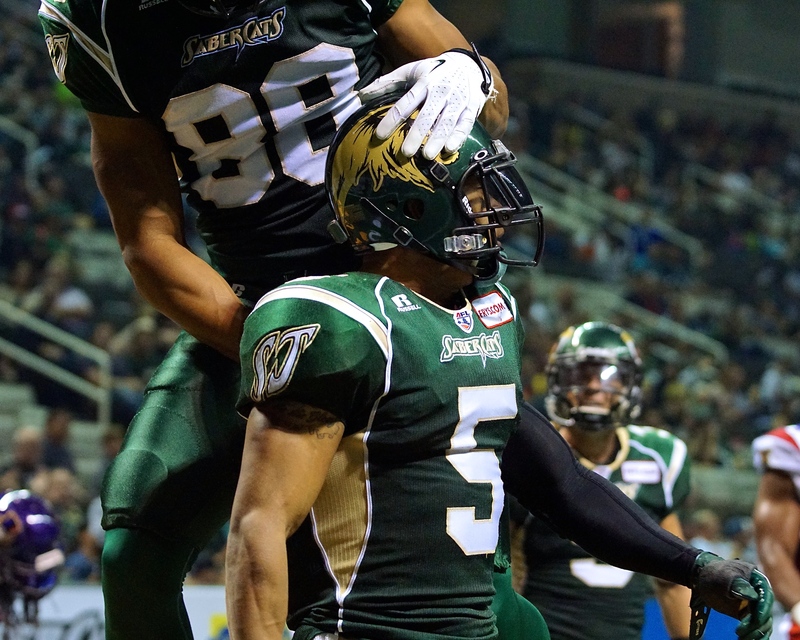 Stephens led the SaberCats with six receptions for 80 yards and two touchdowns. Getting on the board, Tampa Bay cut the SaberCat lead to 14-7 with a 19-yard touchdown reception by Kendrick Ings. Ings also hauled in a nine-yard reception in the fourth quarter to cut the San Jose lead to 36-13. Ings finished with a game-high eight receptions for 100 yards and three touchdowns. 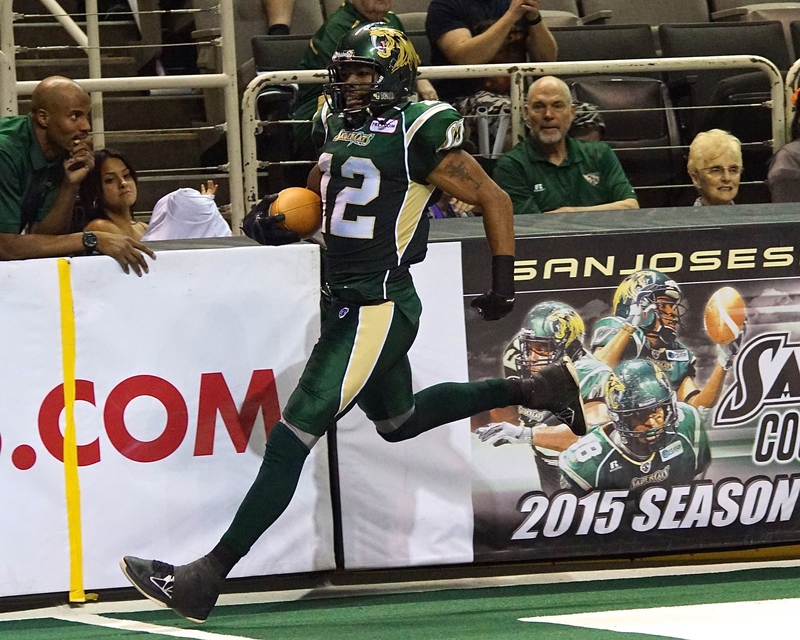 After a Reynolds 16-yard reception brought the SaberCats down to the two yard line, Meyer was able to take in the quarterback sneak for a touchdown to extend the San Jose lead to 21-7 in the second quarter. While Reggie Gray continues to lead San Jose in receiving, Reynolds proved why he was an All-Arena selection last season with the Iowa Barnstormers. Reynolds finished with six receptions for 64 yards. San Jose quarterback Erik Meyer did just enough on offense to pull out the third straight victory for the SaberCats. Meyer finished with 179 yards passing two touchdowns on 17-of-32 completions. Toliver finished with six receptions for 84 yards and hauled in a touchdown reception in the final minute of regulation. San Jose held a 24-7 halftime lead after a 16-yard Nich Pertuit field goal. The seven points surrendered was the lowest total in a half for the SaberCats this season. For the third consecutive game, defensive back Vigil Gray grabbed an interception; on this instance he took away a Storm touchdown in the end zone. Gray finished with five tackles, an interception and his impact has been vital for San Jose’s ferocious defensive attack. Leading San Jose in tackles last season, defensive back Ken Fontenette was all over the field against Tampa Bay. Fontenette finished with a team-high eight tackles, flying around the field for the top-ranked SaberCats’ secondary. On a 2nd and goal from the 17-yard line late in the third quarter, Boltus was rolled up on by his center and Stewart in an ugly looking play. Boltus was able to recover, finishing with 21-of-39 passes completed for 260 yards and four touchdowns. 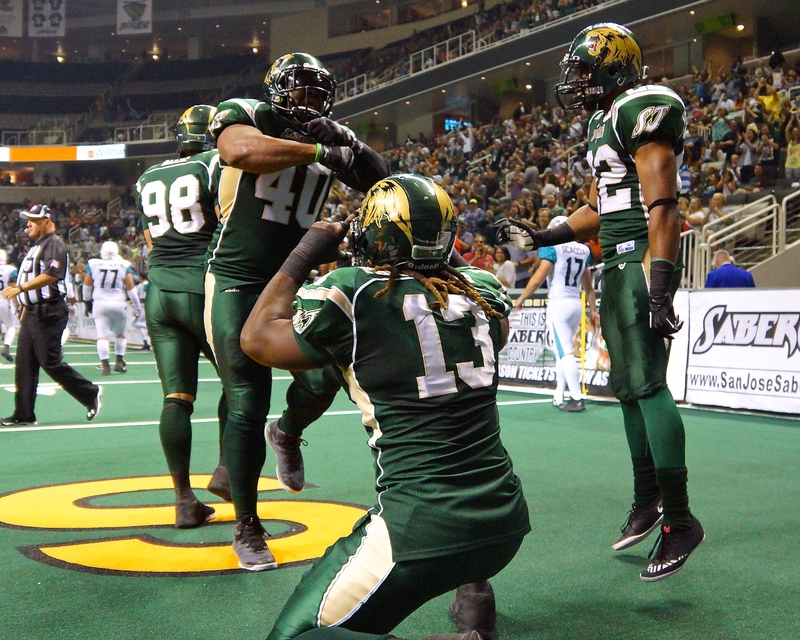 With the win, the SaberCats become the first AFL team in 2015 to start 3-0 and will head to Jacksonville to take on the Sharks on April 17th.